From the book “Team Conflict Resolution Strategies – Fast and Effective ways to Remove and Reduce Stress in Teams”, by Brian V Moore. Brian and Arthie Moore, of Celebrating Humanity International, have over 15 years experience in diversity management, transformational team building and team conflict resolution. 1000s of people have benefited and transformed through the Celebrating Humanity programme©, in South Africa, Namibia, Zambia and the USA. 1. Step 1 – Know what you want to achieve, AND know where you and your team are, before you begin. “Begin with the end in mind” – Steven Covey. It is critical to know and record, what your challenges are at the outset of this amazing journey with your team/s. The team needs a joint vision of what they can achieve through unity, teamwork and harmony. 2. 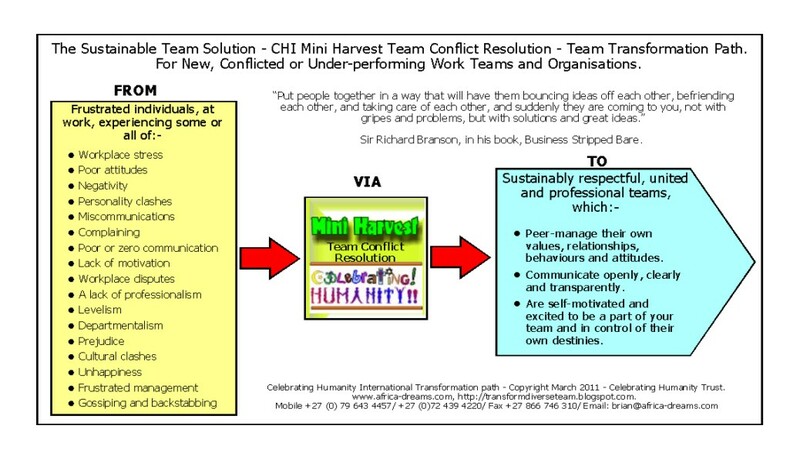 Step 2 – Follow the 8 Principles of Team Conflict Resolution through the internationally proven Celebrating Humanity© methodology. Celebrating Humanity’s unique, transformational team building and conflict resolution techniques are founded in these 8 amazingly simple and stunningly effective principles. 1. “At the level of respect, all people are equal.” – Brian V Moore – 2001. 3. We are perfect as we are. 4. Life rewards action. Positive and negative. 5. It is simply impossible for any person to manage the behaviour of other people. 6. People will manage their own behaviour, if they set the ground rules themselves. 7. “People know and help those who speak up – not those who remain silent.” Oshiwambo proverb – Namibia. 3. Step 3 – Build unified Teamwork across the entire team, company/ organisation. Apply a transformational team building process that will bring harmony, understanding, emotional and social maturity, communication skills, respect, ownership and accountability to your conflicted teams. 4. Step 4 – Set the Peer-created, Peer-accepted and Peer-managed Team Code of Conduct. When your team makes these decisions, and all team members commit to follow an agreed and constituted process – you are well on your way to a conflict-free team, company/ organisation. This reduces stress on management and clients. 5. Step 5 – Clear past interpersonal challenges – and open the way forward. Your team will no longer be dogged by its own conflicted history, the path will be clear for powerful and exciting results and successes. 6. Step 6 – Place your team firmly in charge of their own behaviour. It is at this point that your team members commit to themselves, the company/ organization and immediately begin to operate in a new and safe working environment. 7. Step 7 – Maintain – the new conflict-free status quo. Properly constituted and maintained team agreements which will last for as long as you desire, and your and the team maintain the status quo. 8. What we do NOT do. 1. We never focus on the “problems”, or the “problem people”. If there is conflict in your team, there is far more going on than you will ever realise. And any direct focus on the particular individuals will empower them and ruin the process. 2. We do not have mediation sessions with the “problem people” to clear the problems. This will isolate all of your team members, and the challenges will emerge again, in another form altogether. 3. We do not judge, or work out of our own judgments. 4. We do not send the “problem people” off for emotional, or diversity training, and ignore the rest of the team. 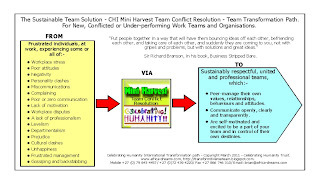 Need Team Conflict Resolution? You are at a Crossroads. Teams, businesses and organizations that are under pressure to transform their conflicted workplace teams, are often challenged by the wealth of “solutions” offered, by companies. Some of these solutions are great – and many are doomed to failure. If your team is being forced to find a team conflict solution, your team is at a crossroads of danger and opportunity. The danger lies in choosing the wrong “solution(s”) and yet, if you get your choice right, there are huge hidden opportunities to build individuals and teams, and thereby reap great rewards. 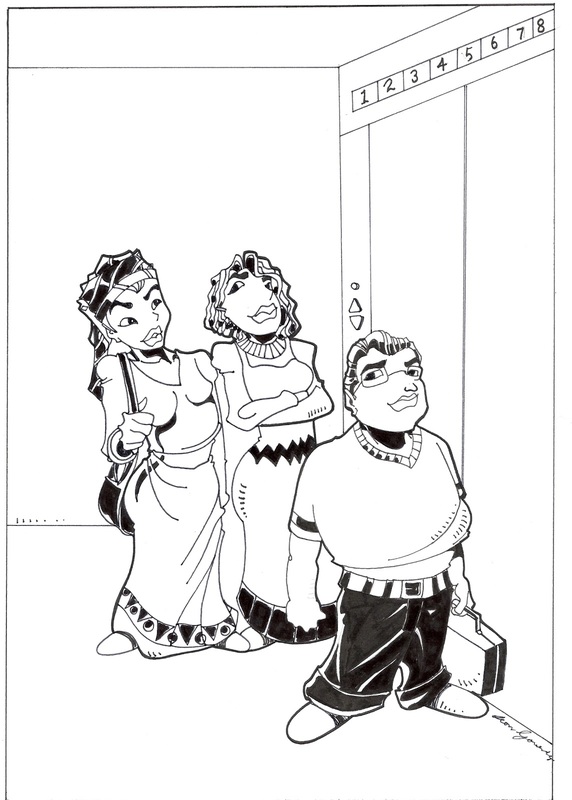 • try isolate to the “troublemakers”, and get them to resolve their differences. • exclude any member/s of the team in the process. • hand the management of the team’s behaviors, with agreements from “team agreed resolution”, to your managers/ supervisors. • isolate, intimidate, or simply ignore certain team members. • neglect the development of communication skills, team and individual personality skills, understanding of the carious diversities within the team. • Go with a talk-down and divisive diversity training program. • Use unsuitable and un-focused team building programs – that isolate even 1 member of your team.. If any of these factors form part of your attempts to resolve team conflict, the process, and your money, will be wasted. More so, it could negatively impact your team – in the long term.. The opportunity to build teams is found in the wisdom, uniqueness, talents and skills of your team. When we hire people, we hope that they are mature enough to manage their own behavior. After we sign the employment contracts, we then begin to control their every action. We put managers in charge of all decisions. Soon we have people who will not even go to the toilet without permission. Our over-control has taken away their sense of value, ownership, accountability and responsibility. And this is where team conflict begins. 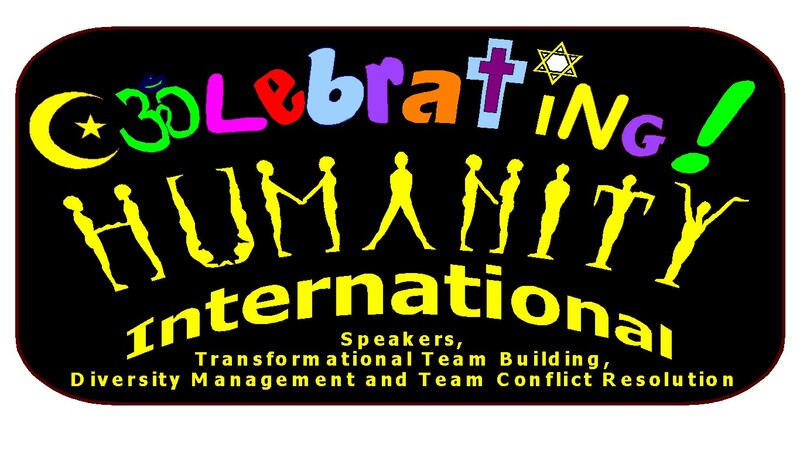 The methodologies included in Celebrating Humanity Diversity Training and Transformational team-building programs – outlined in our book – Team Conflict resolution Strategies – ensures that team transformation is non-threatening, unifying and inclusive. It ensures that we give the power back to your teams – to manage their own behavior – through their own agreements. This takes incredible stress off managers and supervisors, and the business/organization. In turn, empowered people drive your business in a safe and respectful place created by themselves. Our teams bring fun, communication, respect and understanding into the team – before we even look at developing team-based codes of conduct. And when we leave – we have put in place ongoing team-managed processes – supported by our follow-up processes. Our feed back is always taken at least a year after the initial program. And the results are always excellent – without fail! Read the book – and use the lessons therein, or call in our teams. Whichever way your go – this will be the best decision you will ever make. 7 easy steps to remove workplace conflict in just 3 days! How to remove workplace conflict, gossiping and backbiting in just 3 days; follow these 7 easy steps to workplace harmony, and your teams will manage their own challenges, allowing you to drastically improve production and the bottom line! Teambuilding for Diverse teams, makes it easy to transform your team. 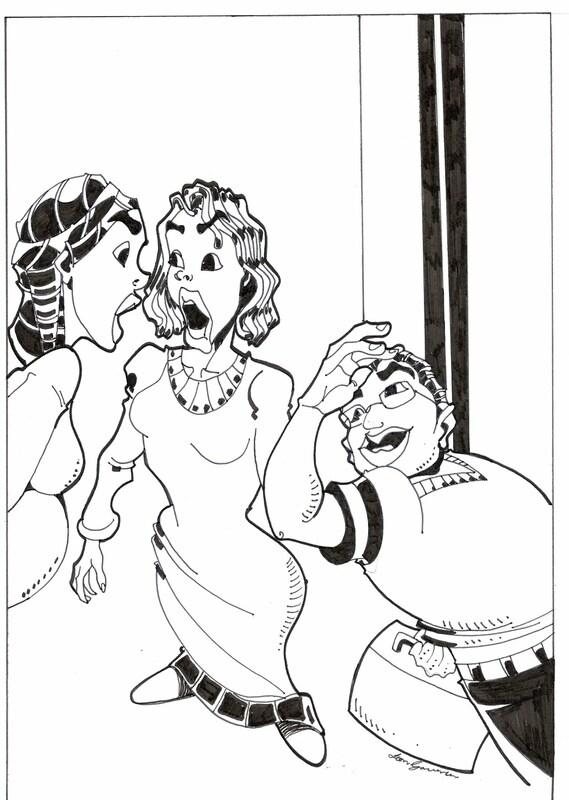 • Incessant Gossiping & Backbiting? Set the ground rules. Keep the rules simple. Get a clear understanding of the rules. Enforce the rules. Reward respect, pro-activity and support. Team members come from different cultures, traditions, histories, genders and ages – these unique differences have the power to unite them. Get them sharing that which maakes them special. Create an environment of communication. Develop the understanding and experience of teamwork, through interactive and exciting team processes. Let your team members experience their individual value, AND the value of their team mates. Teach them basic communication skills through understanding learning and communications styles. Show them how to change their communication style for better results. take them through a team-based personality test and show them how to work with each other, differently, positively and more powerfully! Remove these stresses from your workplace by getting your now-willing team, to manage workplace conflict for you! Get your team to create a interpersonal code of behavior and values to manage their own behavior! Set-up individual face-to-face private clearings to put past challenges behind them. And get them to sign a commitment to their team, the code of conduct AND agree to never mention their past challenges. Step 7. )Get the team to manage their own professionalism, accountability and behavior. Set-up brief and regular monthly meetings, based in the Code of Conduct. Your team will praise & honor each other, build understanding, give support, bring guidance. AND send the defaulters to normal company discipline! help! Your team can and will mutually decide and agree on acceptable and unacceptable behavior. Their “team-managed and ongoing relationship management program” will protect you, your team and your company/ organization from wasting time, managing and stressing out on inter-personal and inter-diversity challenges. Place the challenges of workplace diversity management firmly in the hands of your team/s and let them manage interpersonal interactions, on an ongoing basis! Remember, it can only take 7 steps and 3 days, to develop respect and united teamwork, within YOUR team! Our multi-skilled, multi-lingual and multi-diverse International and South African Teambuilding facilitators , have successfully facilitated team-building and corporate training programs since 1989. And we have offered our services in the USA, South Africa, Namibia and Zambia! Our clients include Namdeb Diamond Mining Corporation (2500 delegates) and have saved tens of thousands of dollars, through creating safe, respectful working environments with their teams. You can too. 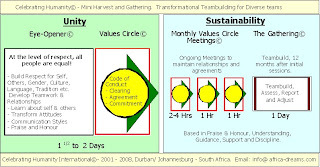 By Brian V Moore – Managing Director of Celebrating Humanity International – South African-grown and based National and International providers of Transformational Team-building© through the Celebrating Humanity© series of programmes. South African companies are either under pressure to transform and include people from all backgrounds in a fair and equitable manner, or once transformed are often challenged by poor inter-diversity relationships and understanding of the need for transformation. Companies and organisations who need this type of intervention are at a crossroads of danger and opportunity. The danger lies in the potentially divisive nature of such interventions and yet there are huge hidden opportunities to build individual, teams, organisation and to an extent the future of our country. The first issue at hand is to establish what the challenges are, as seen by the greater team. It is critical to involve your team and/ or its representatives in a wide-spread interactive and inclusive survey to assess the challenges facing your team. The biggest challenge facing companies, teams and organisations is the diverse nature of their team members. They have been raised differently, communicate differently and value different things is different ways. This can set the stage for some very difficult times in the workplace. Here follow 8 of 10 key steps to ensure that your teambuild is successful. (Please go to www.celebrating-humanity-projects.com/10steps.pdf for the full article. In order to develop ourselves and our team at work we need to develop an understanding of our dependency, independency and inter-dependency. Once we understand that we need each other to survive and succeed we will observe that our actions, positive or negative, impact ourselves, our teams and our dependents. The quality of life that we lead, the clothes that we wear, the humanity that we exude, the food on our table, the education of our family depends on the quality of our relationships within and outside of the workplace. challenge is that diverse teams will only win through respect, tolerance and understanding and that is our starting point. An ongoing process of humanisation and communication builds the group at a human level. Communicating and developing understanding of the commonalities and uniquenesses that we all bring. The next steps would be to develop an understanding of our intra-personal uniqueness and the ability to assess the uniqueness in other people in terms of their personality types and learning/ communication styles. These simple skills will develop and enhance interpersonal understanding and communication. When we take responsibility for our attitudes, our communication and our behaviour we can create a safe environment for ourselves, our families and other people. To further develop a nurturing environment we develop problem-solving and solution-finding skills and learn to handle reactions to external stimuli. Often we act out of historical programming when a short time for thought will break the cycle of anger. When we use the feeling of anger as a signal for thought, “Why am I feeling this anger?” or “Is this person saying this to hurt me?”, we have an opportunity to respond rather than react. This can saves lives, families, sales and relationships! Who adds to me and what do we contribute from our backgrounds, cultures, experience and traditions? Through enjoyable, safe and non-threatening methodologies and processes we are able to learn – from each other – more about our lives, history, cultures and religions. In teams, selected by delegates on the basis of “who adds to me”, we are able to compete in fun and respectful ways on issues of diversity. In this way a safe environment of communication and life-long learning is created. As these processes unfold team members will begin to identify and break down old prejudicial paradigms and the foundations are laid for an ongoing respect based inter-personal team agreement. Most companies and organisation send down a list of management-decided values. Very few people know, remember and subscribe to the values, especially management. These values are only paraded at disciplinary hearings. 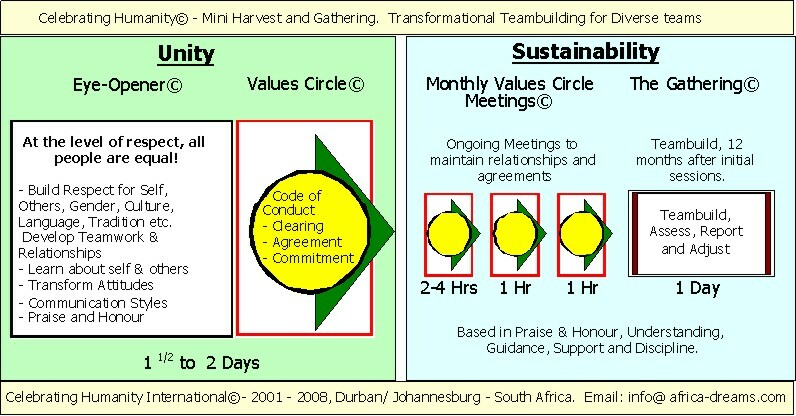 In order for individual change to be perpetuated within the team it is critical that the environment is kept safe and empowering by a team-decided and managed set of interpersonal values. These values are set to manage how team members interact and do not impact or negate corporate values. This people-centred guidance system, if properly designed and implemented, will develop an ethic of praising and honouring the praiseworthy. Those who have personal challenges will often need professional support and those who continuously break the rules must be disciplined. Regular meeting time must be committed to allow the development of understanding and to offer guidance to those who break their self-chosen values. The greater team manages the ongoing process offering support, guidance and discipline in a properly constituted system. In this way we will have developed accountability and responsibility for our actions, within our team and an ongoing values structures to maintain respect and teamwork at the level of human interaction. This will definitely and positively impact family and social interactions. A good leadership team will be part of the development and ongoing implementation of the program and will be subject to the decisions of the structure. A follow-up team-build, assessment and adjustment program should be facilitated approximately 12 months after the Values Circle process is formally constituted. With 1 year history of monthly meetings groups will have transformed substantially and be ready to cement the process into the future. Through this Transformational Team-building© program, people will understand their amazing relevance as individuals, team members & members of their organisations.